It will be the first time an inter-region competition has been held on this scale in Scotland and is set to be one of the major highlights of Scotland’s biennial national sheep event which is organised by NSA Scotland with sponsorship from Bank of Scotland. The event will be hosted at Quixwood by John Macfarlane and his son, Iain. Many of the leading shearers in Scotland will be competing by invitation in regional teams of two for the top prize of £280 for the first-placed pair in the Nettex-sponsored competition which is also being supported by the British Wool Marketing Board (BWMB). “This has never been done before and will generate keen competition between the regions and provide a real spectacle for spectators,” said Dave Turner, former head of agriculture at Oatridge College, who has devised and organised the competition. Each team member will shear four hoggs of each breed in three heats in the morning with the top three teams with the lowest penalty points competing in the final in the afternoon when they will shear 20 Mules. 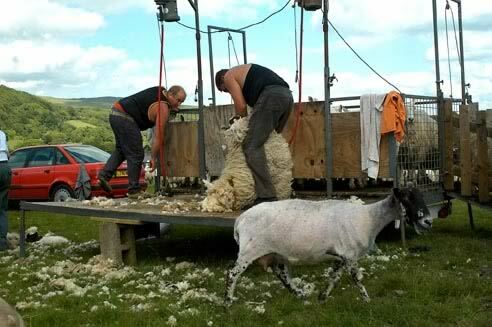 It is also hoped to arrange a Scotland v England challenge between the top two shearers on the day and a team invited from the North of England. Teams taking part will be; West Highlands (Mark Armstrong and John Little), South West (Alan Kennedy and Chris Reid), Lanarkshire (Andrew Baillie and John Lamb), East Central (Calum Shaw and Grant Lundie), West Central (Euan Mackay and Archie Patterson), North (John Blackhall and Simon Bedwell), Borders (Andrew Kerr and Michael Dag) and Berwickshire (Willie Dixon and Neil Anderson). The competition will be judged by Euan Campbell, Strathyre, Peter Kinstry, Broughton, Andy Rankin, Luss, John King, Jedburgh, Lance Armstrong, Newbigging, and Andrew Dodds, Jedburgh.